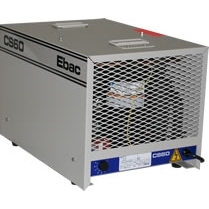 The Ebac CS60 is a no-nonsense, heavy-duty, portable dehumidifier that is at home in a hostile industrial or marine environment. It is ideal for either permanent installation at remote pump stations, pipe galleries, electronic and mechanical equipment areas, or for a quick transport between job sites and problem areas. You can rely on this durable unit to perform faithfully without complicated maintenance or costly down time. Under the operating conditions of 80° F and 60% Relative Humidity the Ebac CS60 will remove more than 56 pints of harmful water vapor per day. The EIPL commercial/industrial dehumidifier was designed to provide energy efficient humidity control in a wide range of applications including offices, laboratories, apartments, storage areas, restaurants, bars, museums, locker rooms, computer, telecommunication rooms and basements. It is a quiet, high efficiency, high capacity unit designed to suit your HVAC needs. The range of EIPL dehumidifiers are ideally suited to prevent condensation from forming on windows, walls and ceilings by removing excess moisture. They will also stop mold and mildew and eliminate rust and corrosion. Sturdy military-type collapsible carrying handles. Click here for more shipping details on the Ebac dehumidifier.